Availability: Out of stock. Estimated to ship in 2-3 weeks..
A good pair of gauntlets will serve any warrior well by not only keeping their hands, particularly their sword hand, protected, but by also enhancing their overall look. And these Medieval Gauntlets are some of the best that any warrior could ask for! Two particular factors converge in these gauntlets to make them so incredibly impressive, and those are quality of construction and hardiness. Crafted from 16 gauge steel, they are rather hardy, offering substantial protection to the hands and wrists, while their fine level of construction ensures that they do so without interfering overly much with the traditional range of movement. 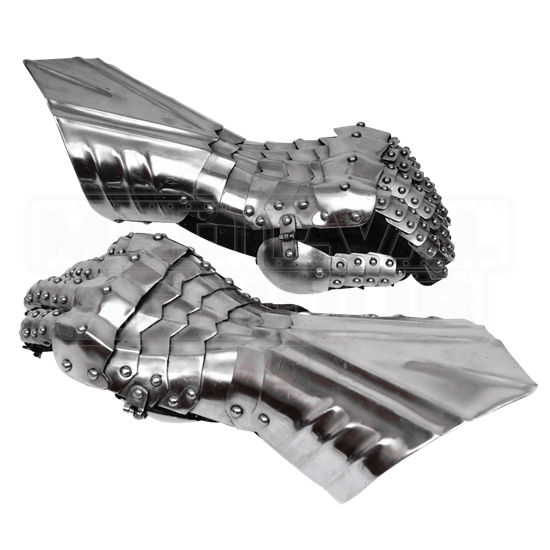 Made from 153 rivets and 46 independent parts, these gauntlets have an impressive level of articulation, ensuring that your hands, even coated in steel, will retain all the fine manual dexterity that you'll need when wielding a sword or a knife. Included with the gauntlets are leather gloves, which help to make them much more comfortable to wear. A classic steel finish makes these Medieval Gauntlets look like iconic pieces of armor, and indeed they are, as they will suit almost any warrior perfectly, thanks to their combination of fine, strong materials and quality craftsmanship.